Socialist Alternative is in political solidarity with the Committee for a Workers’ International (CWI). In recent months, we have publicized the heroic work of our fastest-growing sister organization in South Africa. Please see socialistworld.net to read about the impressive movements of the CWI there. In this issue of Justice, we’d also like to highlight two key articles on the situation in Sweden. Swedish society is often seen as “social-democratic” and “equal.” In reality, Sweden is home to the world’s fastest-growing gap between rich and poor. The Economist magazine calls the changes to Sweden’s economy a “silent revolution” over the last two decades. Social programs have been destroyed, workers have been laid off, and previously state-owned companies have been privatized. 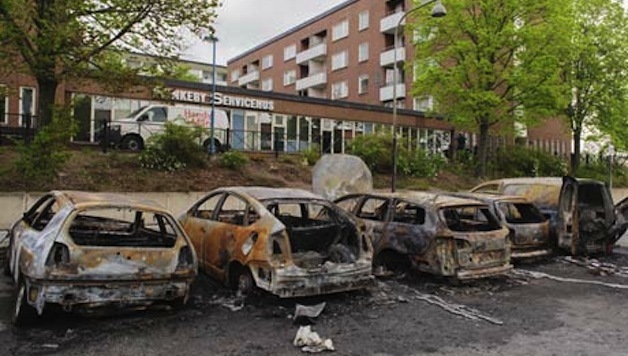 Sparked by police violence, the poorest areas of Sweden erupted in riots this May. This explosion of anger shows the deep dissatisfaction with the changes in Swedish society and the deepening inequality. The immigrant population has been hardest hit with increased poverty and heightened racism. The Committee for a Workers International has a significant organization in Sweden. Below are two articles about the riots and the conditions that helped create them. Next articleSupreme Court Strikes Down DOMA and Prop 8 — What Next for LGBTQ Liberation?